TableTop Day is March 30! GAME ON! GOOD NEWS, EVERYONE! Y’all know I love me some video games, but did you know that I’m also an avid tabletop gamer? D&D is my forte, but I love Munchkin, and recently discovered Ticket to Ride as well as Fluxx, and I’m hoping to join the many who have been sucked into the epic Catan. Little known Nikki-fact: my favorite, more traditional, tabletop game is Yahtzee. LOVE it! On March 30th, 2013 , we ask you to go to your friendly local game store, neighborhood coffee shop, school auditorium, community center, or host a game day at your home and play more games. You can find a TableTop Day event near you by heading over to the Official Website. The site also has downloads, details, and a blog to follow so be sure to check it out. I actually have a wedding to attend on Saturday but maybe I can get the entire wedding party to sit down and roll a few dice. Who knows. Make sure you use the hashtag #TableTopDay and share pictures! At the beginning of March, I was able to attend STAPLE!, the independent media expo that happens here in Austin every year. I’ve been the last three years and it just keeps getting bigger and better every time. I have a lot more blog posts that I’ll be writing showcasing some of the folks I met, but I’m going to kick it off with an artist showcase/Kickstarter fundraiser post all rolled into one. 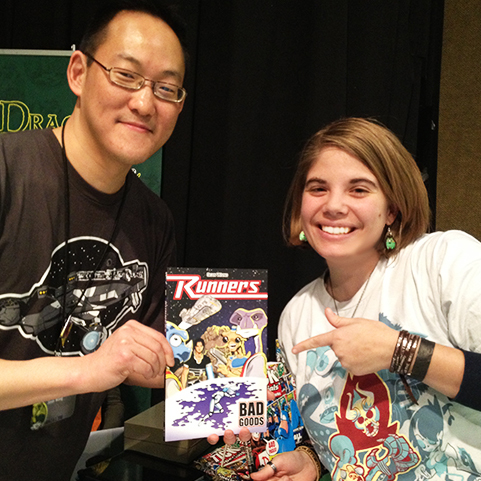 Sean Wang is the writer and artists for the comic/graphic novel RUNNERS. I had never heard of it, but was introduced to Sean through the awesome event coordinator from Dragon’s Lair Comics, which is my favorite comic shop in Austin (but I can’t remember the event coordinator lady! Who are you? You are awesome!). I picked up his book while I was talking to him and was instantly hooked – I love his gorgeous lineart and the story grabbed me from the first page. I ended up going back a few hours later to buy the first RUNNERS book and ask I could interview him for Snailbird. Timing was perfect – Sean did a panel discussion on kickstarting your webcomic with Kickstarter and was currently promoting his own Kickstarter campaign as well so he agreed! So without further ado, here is the interview! 01. Tell us a little about yourself and what Runners is all about. Sure! My name is Sean Wang and I am a comic writer/artist. 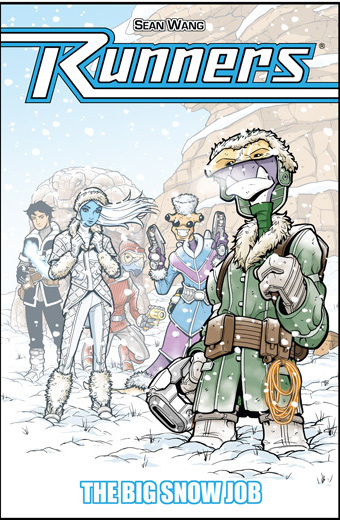 I got my start on the TICK comics for New England Comics and also did MELTDOWN for Image, but my main project is my self-published sci-fi series RUNNERS, which is a fun action-comedy space adventure that follows the exploits of a crew of alien smugglers. Basically, they’re a rag-tag group of (mostly) aliens who take on smuggling runs for the mob that tend to spiral out of control. 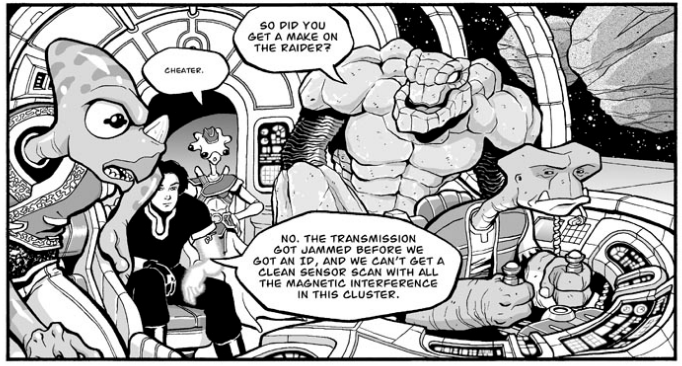 In the first story arc, RUNNERS: BAD GOODS, they are trying to complete one particular run that has them pursued by pirates, mercenaries, and an entire space station full of police, all trying to get to their cargo. In the new story, RUNNERS: THE BIG SNOW JOB, they take on a seemingly trivial job to steal a herd of yak on a frozen planet, but that job also goes south rather quickly as they find themselves pawns in a series of escalating double crosses. 02. What is the process for creating each page of comic – is it completely digital or do you combine it with traditional work? It is a combination. I still pencil and ink traditionally on bristol board at comic size (11 x 17″). I typically use blue lead mechanical pencils for the penciling part and then a combination of Micron pens and Japanese brush pens for the inking. Once that’s done, I scan the page and do the coloring and lettering digitally in Photoshop. 03. Why did you decide to start a Kickstarter and did you expect it to get so big so fast? Once the second story had finished posting online, I started planning to also get it into print form. The first book was black and white (and grayscale), which wasn’t all that expensive to self-publish. But the new story is full color and I knew the printing would be much more expensive than the first book. So I decided to turn to Kickstarter to help me fund the printing. My modest hope to to bring in enough money to offset some of the costs, but I was very pleasantly surprised to see it completely funded! I hit my initial goal of $6000 in the first 2 days and my first stretch goal of $8500 (to print the book in the U.S. instead of overseas) a few days later. I guess a lot of readers were very excited about having the new book in graphic novel form and I’ve also had a great number of new people discovering the series, which is always a plus, because beyond just funding the project, it was very important for me in using Kickstarter to bring in as many new readers as possible. 04. What was the most surprising technical thing about the Kickstarter process? I was actually surprised with how easy it is to put a project together on the site. That’s not to say there isn’t a lot of work that had to be done, IE figuring out all the cool reward items to offer for the various tiers, researching all the shipping and supply costs, getting the video and all the visuals together, etc. But once all that was done, getting all that info up on Kickstarter was a fairly easy and painless process. I was expecting a few more quirks and technical glitches, but they really designed a great site with a very smooth process. 05. What advice do you have for someone wanting to start their own webcomic/graphic novel/Kickstarter? I can’t really say I have the best advice for doing a webcomic, since I don’t really follow the successful mold there. Given the nature of my storytelling and art, I need to fully script each storyline ahead of time, then do all the concept design, and then do the actual pages, which also take a lot of time to pencil, ink, color, and letter. So when I was posting the stories, I could only get up a page a week, and then there are long hiatuses between arcs as I frontload the work on the next one. To have a webcomic though that really builds traffic, you need a very regular (and frequent) update schedule. There are a number of successful webcomics out there, and you’ll usually find them posting new material several times a week without ever missing updates. It’s important to maintain that kind of discipline. As for Kickstarter, it’s important to realize that it’s not quite as simple as you putting up a project and getting free money. Your chances of success will be greatly improved if you go into the project with a sizable audience already. The more people you have already familiar with your work, the more you have already willing to contribute without you having to sell them on an unknown quantity. But as far as bringing in new people, it just helps to have as professional a product as possible. Presentation is key: try to have the best art possible, clearly explain your series and goals on your project page, put together a good video that conveys that information as well, and stay in constant contact with your backers through updates and other postings online. 06. And finally! Who is your favorite Runners character? That’s a tough one. I really can’t say I have a favorite since I always wanted to develop them all in such a way that any one of them could be a favorite for any reader. They all have different personality traits that make them fun or interesting in their own way, so hopefully no one character really steals the show. That said, I do think Cember is a lot of fun to write just because he is the most jokey one of the group but isn’t a total clown. He comes across as carefree but I think he’s only able to do that because he knows he actually has the chops to take care of a bad situation should one arise. I also love Roka as a character because he’s the exact opposite of Cember. He’s a bit more broken and unsatisfied with his lot in life. I didn’t want him to be a depressed or depressing character, but he certainly carries a lot more weight on his shoulders than anyone else, and that kind of struggle with the burden of leadership is very interesting to me. 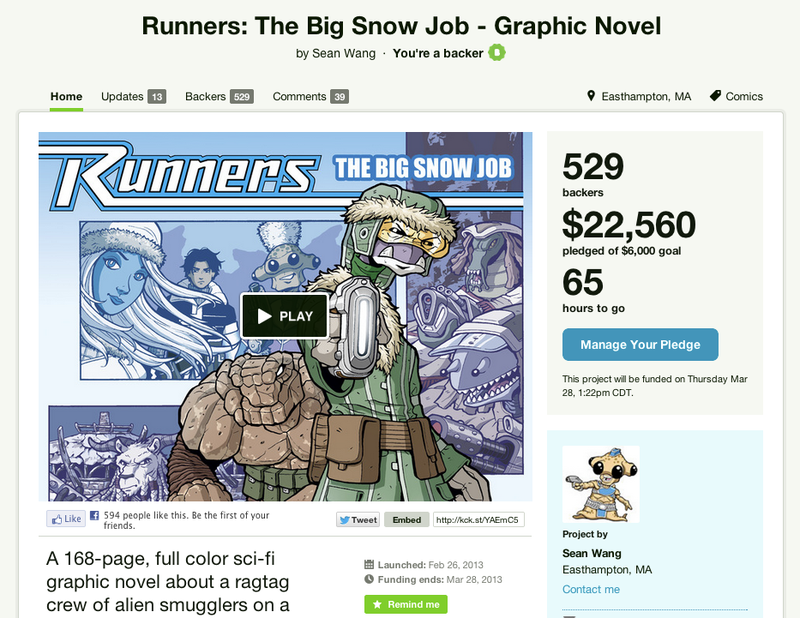 But I think all the characters are a lot of fun, and it seems my readers are really having a great time with the series as well, so if you like fun sci-fi action adventure with cool alien characters, be sure to check out the RUNNERS: THE BIG SNOW JOB Kickstarter project (ends March 28)! Thanks Sean for the awesome interview! If you enjoyed this, be sure to check out more of Sean Wang at personal website, at Runners Universe, and on Facebook! And don’t forget to pledge to his Kickstarter project! Well it’s Day One of the #SXyote adventures and while the majority of my day will be spent in the Gaming Expo for game reviews, demos, and a few sessions, I wanted to start off the day by thanking my Day One Sponsor: Embrace Pet Insurance! They are not only a sponsor this year, but they were one of the very first sponsors of the first fundraiser last year – so HUGE thanks to them for continuing to believe in my cause. You guys are awesome! I now only love them because of their sponsorship, BUT they are also our very own Pet Insurance company! 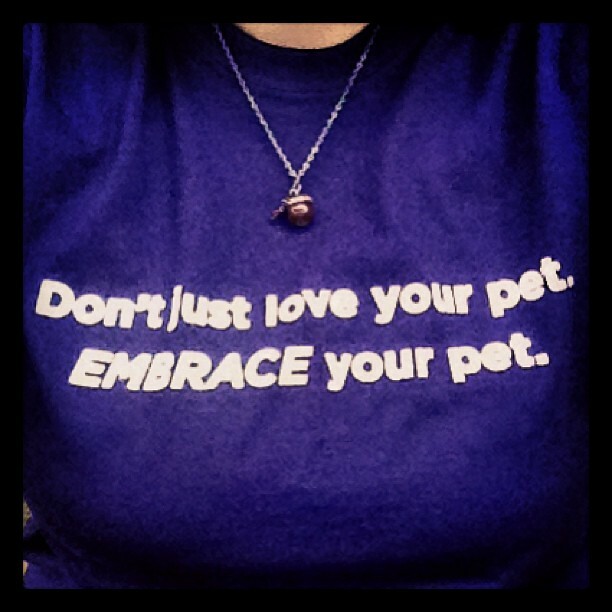 Most of our furkids are covered under their insurance so my shirt is pretty on the mark for us – “Don’t just love your pet, EMBRACE your pet!” We do! Do you! Embrace was created by Laura Bennett and Alex Krooglik in July 2003. Laura and Alex spent several challenging years establishing Embrace. With a number of â€œone step forward, two steps backâ€ experiences that often led them to wonder if they would ever get Embrace up and running, they persevered and laid the groundwork for Embrace today. Their core values are: We Are Open & Honest, We Believe In Customer Fixation, We Give Back to the Community and Help the Environment, We Take Personal Responsibility, We Seek Innovation, and Be Passionate. We love Laura, Alex, and the whole Embrace Crew! Thank you again for sponsoring Day One of SXyote! Don’t forget to follow the hashtag #SXyote for lots of great livetweeting and pictures!